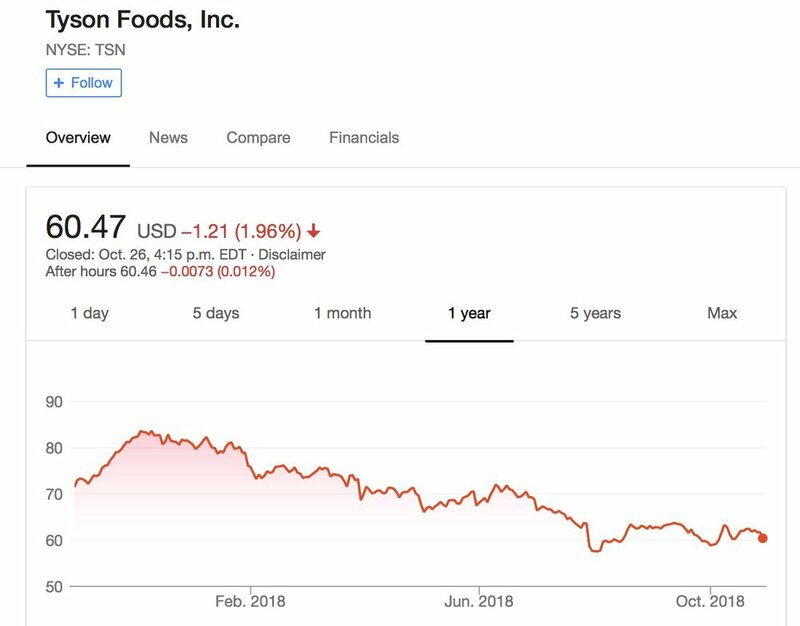 I had only initially bought a handful of shares in Tyson and I wanted to accumulate some more, so with the stock remaining in the $60 level and the Canadian dollar somewhat stronger, I decided to buy some more shares. My cost base moved up slightly to just over $60/share. Update (March 26 2019): Sold shares in Tyson for 19.8% gain (net Forex). Decided to bank the profit as the stock crossed my 20 percent return threshold. Just following my playbook. Stock moved pretty fast from $50 in December. I still like the company and would buy back in if it pulled back at a lower price point. I spoke to this in my July-August update as I had been building up a position in JD and suddenly decided in September to get out. I am including the writeup here as well. This was a tough one. Readers and listeners who have been following my blog and podcast have know that I have been slowly buying JD as it has been going down to lower my costs. I still think the fundamentals of the business are quite solid as they are aggressively positioning themselves being the OS for retail in China and Asia. They have aligned themselves with some heavy weights (Walmart, Tencent, Google) to build out a formidable retail ecosystem. I was thinking of holding on because of a somewhat similar situation occurred with Baidu, albeit nothing to do with assault and crime. One of their key managers suddenly resigned and the stock plummeted. I held on because I thought a company is bigger than one person and sure enough the stock rebounded. I was thinking in a similar fashion with JD, but I think this governance issue has the potential to distract the company and I don’t want to be holding shares while this is going down. I still like the business and if they are able to realign their management structure and set a clear path for more reasonable governance than I may jump back in. If it is at a lower price point then all the better. It’s really tempting to hold on and fall in love with our stocks, but there are times where it’s critical to cut it off and start clean. It’s an occupational hazard. I’m confident though that there will be other opportunities that will make this pain go away. The stock has been sliding downward in recent months, down the $27-28 level. My average cost was at $31. In fact all the major casino stocks have been falling off. Part of it has been tepid revenues from Macau. Despite the fall, there have been some positive news coming out. One is that revenue especially from Macau have been rebounding. The second is that a private equity firm Starboard Capital which is known for taking activist positions in companies that they feel are undervalued, has bought a position in the company. So we could see some push for changes in the business that has been a laggard among the casinos. This might give the stock price a little juice. I still like the fundamentals, especially how MGM is positioned quite nicely to take advantage in the loosening of sports gambling laws in the US. With these positive elements in play as well the stock still below my cost base, I thought it was a good time to buy some more shares to lower my average cost. With the casino stocks falling, I’ve also been looking at perhaps picking up another stock as they all have been tracking down. This decision was also a very difficult one because there is also some politics at play here. The CEO of LVS is Sheldon Adelson, who is one of highest financial donors of the Republican Party and has a very close, close relationship with the current US President, who I do not particularly like and care for. I kept going back and forth on whether I want to invest in a company that supports and in fact encourages policies that I feel are divisive and ultimately anti-business. If I buy Las Vegas Sands does that mean I endorse these policies? The decision started about understanding and evaluating the fundamentals of the business and then was layered over with the political component and to a certain extent a value component. I went back and forth on it. The irony is that the trade trash talking the President is engaging with in China will negatively impact a business like LVS that generates significant cash flow from the Macau properties. Maybe buying the stock is not the way to go. There’s a lot more chatter from people who are ready to boycott travelling to the US or to stop buying US made products because of the polarizing political climate. Avoiding to buy US stocks can be a way express yourself politically. Is it the most impactful? I don’t think there is formula you can plug in and figure this out. Should politics triumph over business or vice versa? At the end I became of the mindset that this political sucking of oxygen is unsustainable and economic reality will override political ideology….I hope. I don’t know. Again confusion. I took the decision to buy the stock. I think LVS is a good company. It creates tangible wealth in an area where there is consistent demand for their products. This side I feel pretty good about but this cloud that is growing over the US keeps trying to pull me back. Is it a permanent cloud from Mortdor or a passing cloud? I still don’t know if I’m all in on it as I may end up selling it. At the end, this is about me. I have a very limited window in my life to invest and I don’t get to roll-back the clock. I have to be continuously investing and putting my money to work prudently if I want to improve my financial security. When I looked at it from this perspective, I decided I should buy Las Vegas Sands. This is hard stuff and even for people who are formally trained and have letters after their name. As someone who teaches investing, the best way we can try to rationalize our way through it is to bring it back you ourselves and our values and provide context on the decision.